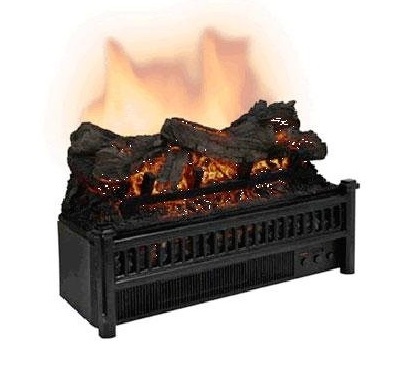 Are you looking for an affordable, realistic electric log fireplace insert for your home? Adding an electric log fireplace insert is the best way to add a traditional warm fireplace log experience to your living room or bedroom without going through the trouble & expense of installing, cleaning and maintaining a real wood-burning unit. In this guide, we review & compare the five best-selling, top-rated electric log fireplace inserts selling today. Every one produces a realistic fire effect, and some offer flame heat. But before we dive into the reviews, let’s start with a quick definition of what an electric log fireplace insert actually is. What Is an Electric Log Fireplace Insert? Electric log inserts are self-contained appliances that simulates live flickering flames using one of several different methods. Most use electric or ethanol technology to produce the simulated flame effect. 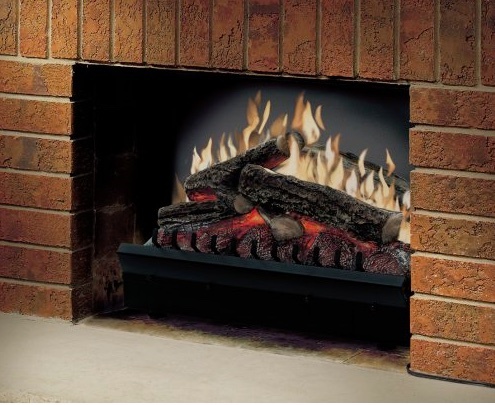 Log inserts are the most popular type of electric fireplace insert sold, today. Today’s electric fireplace inserts use LED lighting, water vapor or a light fabric & a fan to fool the eye into seeing live flames. Some of these flame effects can be incredibly realistic. Some electric log inserts also produce heat, but many are simply for show. Ethanol log fireplace inserts burn cool-temperature alcohol mixed with special dyes to simulate a colorful wood fire. Most ethanol inserts are not used for heat, they are simply for show. The downside of an ethanol unit is you have to replenish the fuel/dye mixture. Cost to Own: most log inserts are extremely energy efficient, especially ones that don’t emit heat. Programmable: many units can be programmed to turn themselves on and off. Some produce a range of special effects controlled by remote. Easy to Install: many log fireplace inserts can be installed without the use of a professional electrician or carpenter. Listed below are five popular top-rated log fireplace inserts that you can’t go wrong with. You’ll see that Dimplex units dominate our favorites. And that’s for good reason: no other line comes close to producing such a realistic flame effect. The Comfort Glow produces realistic looking flames that mimic the effect of a wood-burning fireplace. Though this relatively inexpensive log fireplace insert will never look exactly like the real thing, it nevertheless creates coziness while warming up the room. 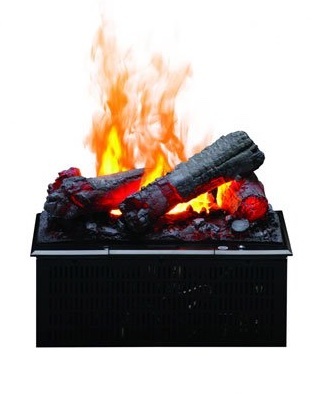 It’s also a steal for a log insert, normally priced between $140 to $200 on Amazon (click to see the latest price). LED lighting is used heavily in achieving a real fire effect. It therefore might be a worry that the fireplace will use up too much energy if left on for long. The LED used is energy saving ensuring that your power bill stays low. To get the full effect of a fireplace, the logs are made to look as realistic as possible. In addition to the dancing yellow flames produced using light projections, the logs themselves have an inner glow that makes them appear to be burning. At 4600 BTU maximum output, the heat emitted by the CG electric log set is enough to warm up a 400 square feet room. The heat is forced out of the unit through a vent by a blower. If it gets too hot but you still want to enjoy the fireplace, just turn off the heat and turn it on again when you need the heat. By being able to operate in both modes, the fireplace can be enjoyed all year round regardless of the weather. ● 4600 BTU heat output at a power rating of 1500 watts. ● Included with the unit is a remote control for convenient operation. ● Measurements: 23 inches width, 13 inches height, 9 inches depth. 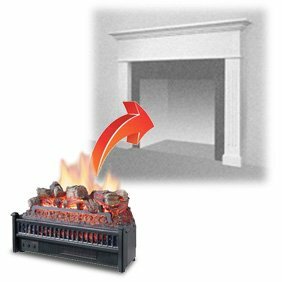 Like other fireplace inserts with heat output between 4000 and 5000 BTU, the CG electric log set cannot heat a large room. If you have a very large room you may want to consider other more powerful alternatives. The Comfort Glow electric log set is an affordable and easy way to add a realistic fireplace experience to any room. While other electric fireplace inserts do a decent enough job simulating flames, none comes close to what the Dimplex Opti-Myst achieves. The Opti-Myst line makes use of manufacturer Dimplex’s unique misting technology to create an extremely realistic effect of flames and smoke. When it is on, it is easy to mistake it for a real fireplace. This patented technology is not cheap. but you pay for what you get. This unit comes with a water reservoir which has to be filled with water. During operation, water is released from the reservoir as a mist. As the fine mist passes through LED-emitted light, it reflects the light in different directions creating an effect of flames and smoke that’s eerily similar to that of an authentic wood-burning fireplace. You have to see one in action. Switching from a wood burning fireplace to an electric one does not translate into higher energy costs. This is because the power consumed is very little. This is particularly true with this unit. Cycling at 50%, the Dimplex Opti-Myst uses only 1 penny per hour of power when the flame is on. If you turn on the mist effect for the smoke illusion, energy costs are only 7 cents per hour. One full tank of water will operate for 14-17 hours before you need to refill it again. Since you are not using the appliance all day long, one tank can last several days. You don’t have to worry about any harmful emissions from the unit. ● Traditional log design, suitable for most decor. ● An on/off remote for convenience. ● A contemporary black finish on the exterior. Fits well in any type of décor. ● A voltage of 120V and wattage of 200 watts. ● Dimensions: 16 inches width, 13 inches height and 8.5 inches depth. The bulky power cord might complicate placement of the unit. At over $1,000 retail, it’s not cheap; but this Dimplex Opti-Myst insert is as close as it gets to a real wood-burning fireplace without having to deal with the cost, smoke and soot. The groundbreaking Opti-Myst technology, combined with the overall look of the unit, delivers an experience you cannot get from any other fireplace insert. The stunning jet black design of the Dimplex Opti-Myst Pro Fireplace is the most unique aspect of the unit on first sight. The sleek design fits perfectly with homes that use a modern style of décor. And Dimplex’s famous Opti-Myst patented technology creates one of the most realistic electric fireplace effects you will find in any fireplace insert. This electric fireplace is very unique in that you can see smoke. But it is not real smoke. The smoke and flames effect is created using ultrasonic technology. Water mist mixes with emitted light to create light reflection which creates an illusion of real smoke and fire. The result is an authentic resemblance to a wood-burning fireplace. To get the smoke effect going, you have to fill the tank with water. A full tank can easily last for 14 to 17 hours before you need to make any other refill. This translates into several days of use, considering that it is not in use the whole day long. As for the water, normal tap water is good enough, the unit does not need any special water. The faux logs are intricately handcrafted to offer as much authenticity as possible. They are molded from real wooden logs to ensure a similar shape and look. Thus, the log set looks no different than wooden logs burning in the fireplace. Like most other modern-style fireplace inserts, this unit is designed to be connected directly to the mains. This ensures a clutter-free installation that helps preserve the sleek style of the fireplace. But if this is not an option for you, a plug in accessory is also available. No harmful emissions are produced. The only thing produced is the water mist which is completely harmless. The smoke and fire observed is an effect of light reflection. ● Requires a connection to a 120V power source. This can either be a wall socket or the mains circuit. ● The unit comes with an inbuilt heater which distributes heat using a fan. The heater can warm a room of up to 400 square feet. ● Measurements: 28 inches width, 19.2 inches height and 10.2 inches depth. ● A modern black finish. This unit has a rating of 5 out of 5 on Amazon. This is still a relatively new product, so customer reviews are just starting to come in. The Dimplex Opti-Myst Pro Fireplace delivers what most other electric fireplaces can’t; great design, ease of use, adequate heating and a realistic fireplace effect. Though it is much pricier than other models, in this case the result is worth the high price tag. The DF2524L is an affordable alternative to Dimplex’s more costly Opti-Myst units. Even though the flame effects are not quite as amazing, this unit doesn’t compromise on quality or style. It’s actually a great deal compared to similar-priced models from other manufacturers. In creating as realistic a flame as possible, the manufacturer relied on a unique technology. When you switch the fireplace on, what you see is close to what you would see in an actual fireplace. 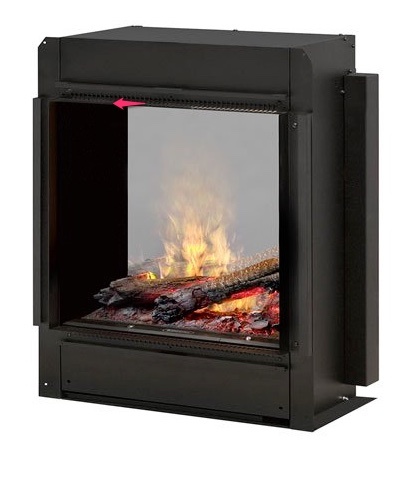 The DF2524L has a unique ember bed is where the realistic looking logs are placed. The logs are modeled from real wood. Onscreen LED displays inform you about the temperature and timing cycles. The flame effects used in the unit makes use of energy saving LED technology, as well. As a result, you only pay pennies per hour when using this fireplace. Furthermore, the longevity of LED lighting ensures that your unit stays functional for a very long time. A fan-forced heater emits enough heat to keep an average-sized room warm and cozy. There is a thermostat included for easy control of heat settings. You can further cut back on your energy costs by lowering the central house thermostat and letting the DF2524L do the heating. You can control all functions of the DF2524L 25-Inch Electric Fireplace Insert from the comfort of your couch. You can install this ventless unit in an existing fireplace or in a recessed area such as a cabinet. No hard wiring is needed; simply plug it into a 120V power source. • 25 inches width, 22 inches height and 7 inches depth. • A voltage of 120V and wattage of 1400 watts. • On safety, the front glass stays cool making it harmless to touch. • Highly economical and environmentally friendly. Do not expect this unit to heat a large room; it is ideal for small to average sized room up to a maximum size of 400 square feet. This unit also lacks the Opti-Myst technology of much pricier Dimplex fireplace inserts. 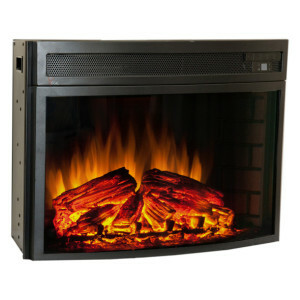 Offered at a much lower price than other Dimplex products, this fireplace insert isa strikingly good deal. It has a great design, functions well and is a pleasure to use. Highly recommended. The DF2309 is one of the cheapest and most popular Dimplex fireplace inserts today. While some of their electric fireplace inserts retail for almost $2,000, this unit can be found online for less than $200. That’s due to its lack of Opti-Myst technology. But the DFI2309 does not compromise on quality or function. This compact (23.2 inches width) unit still packs a punch. It’s one of the best bargains around AND one of the highest-rated units for sale, which explains its popularity. Just insert it into your existing fireplace and you are good to go. Like many other fireplaces, you can also install it in a recessed cabinet space. For power, just plug it into a standard household socket. The unit comes with a fan-forced heater that is good enough to warm a small to average sized room (max 400 square feet). The flame and the heat aspects of the unit operate independently of each other. You can turn off the heat while keeping the flame going. Even better, you can set the ideal heat level depending on the weather. In winter, turn it on full blast. When its warmer, keep it at half capacity. In the heat of the summer, turn it off completely. For convenience, there is an on/off remote control. • Dimensions: 23.2 inches width, 19.8 inches height and 10.8 inches depth. Out of over 300 customer reviews on Amazon, this unit has received an average rating of 4.2 out of 5. This is a high rating for such a popular product. Unfortunately, the remote control can only switch the unit on or off, it cannot change the heat settings. This forces one to manually change heat settings on the unit, which is a bit of an inconvenience. Another concern is the highly reflective back end of the unit. It can reflect light creating an unappealing halo effect. 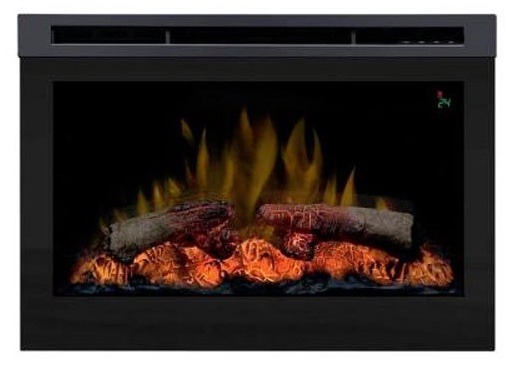 The DF2309 is arguably the best budget electric log fireplace insert on the market today. For its low price, it delivers a nice set of features and does not disappoint when it comes to aesthetics. The heater is also good enough to heat up an average size room even when on a low setting. Despite its low price, it delivers an experience on par or even better than many more expensive models.